Getting new employees ramped up quickly is the challenge and goal of every company, but the hiring and onboarding process is a particular strain on smaller companies. Fewer resources exist to support the orientation and training needs of the new team members inside a company. Large companies may be able to devote resources to a dedicated onboarding program that spans weeks… but small companies don’t have this luxury. We recently worked with a regional CPA firm, Umbaugh and Associates, that fit the above description. Umbaugh has more than doubled in size in the past five years. and they expect growth to continue at a healthy pace. However, even with this doubling, the firm remains smaller than 100 people. There is an HR manager, but training and development is only a part of her significant responsibilities. Like most companies with less than 250 or 300 employees, there is no dedicated L&D function or personnel. The annual ASTD State of the Industry Report consistently notes the challenges of companies with fewer than 500 employees. The annual amount they pay per employee for training is $1,800 – well above the $1195 per employee larger companies (more than 10,000 employees) pay. There are simply fewer efficiencies of scale. Umbaugh has other constraints common to small firms (10 to 250 employees). They have to be extremely judicious in selecting technology, deciding how to allocate subject matter experts’ time, and how to develop and deliver training. Since we’re a small firm ourselves – and know the pain and challenge of successfully ramping up new team members, we were eager to support Umbaugh. Our goal was to design a solution that Umbaugh could reasonably implement given its company size – and to do the analysis and design for a reasonable price that allowed Umbaugh to spend the majority of its budget on development and technology acquisition. We spent two and a half months doing analysis and design work with the goal of delivering a curriculum that Umbaugh could develop with a minimum level of support from us. The curriculum we designed would cost six figures to develop were we doing 100% of the work ourselves on Umbaugh’s behalf. Umbaugh is going to blend use of its own personnel with strategic coaching from us to produce a solution that is less costly and enables their experts to strongly shape its content. Assigned the two Partners the task of generating a list that described what a new associate should be able to DO (not know, believe, or understand) within a year. Interviewed several new and tenured associates. Showed them the list of skills/expectations and had them rate how difficult each one was to learn, the frequency with which they performed the skill, and the importance they felt it had to their jobs. We also let them add skills as well as identify any existing resources they’ve used to acquire the skills or abilities on the list. Shared the revised list with the senior leaders and winnowed it DOWN. If tasks were done very infrequently (less than 1x/month) or were low-value tasks, we eliminated them. We re-focused on a few key job skills and then did a more detailed task analysis of these project-based skills to find out how many sub-tasks were required to execute them. Based on this data, we created an overarching goal for what a new employee should be able to do within 1 week, a month, 3 months, 6 months, and a year. The emphasis on “do” is important as it clearly diverges from a focus on “what we want people to know,” a common behavior in any firm. Mapped the agreed-upon knowledge and skill needs across a 12-month continuum. This visual enabled stakeholders to see where their goals were unrealistic and where they needed to make adjustments to avoid overloading the new-hire with too many new things at once. Self-study: Computer-based instruction that enables associates to quickly acquire knowledge and skill at the point of need. Hands-on labs: Face-to-face instruction that complements self-study elements. Hands-on labs use an “explain, demonstrate, practice, and apply” format that has learners DOING rather than simply listening to a lecture. Structured, on-the-job experiences: Includes observation (watching a skilled performer complete a task) initially and later opportunities to perform new tasks with supervision. 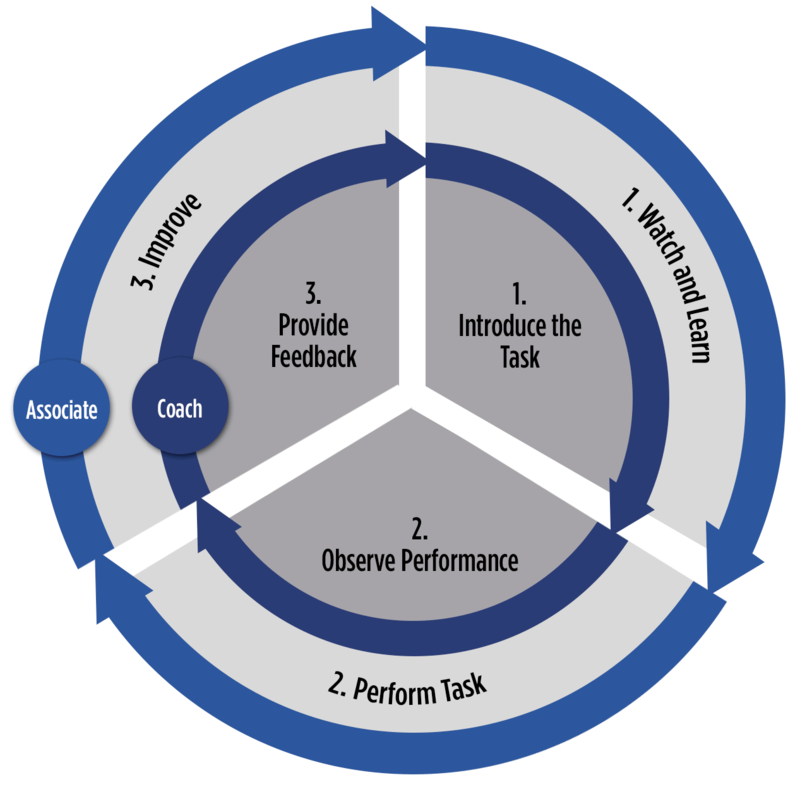 Coaching: Coaches review associates’ work product, observe performance, and conduct structured, one-on-one discussions to foster continuous improvement (with the assistance of coaching tools). Coaching should occur on a proactive, regular basis. Mentoring: During the first year, mentors act as a guide for new associates, helping them keep track of what they have learned and what they still need to learn to succeed. Resource library: All materials related to the curriculum are housed in the resource library on Sharepoint for associates, coaches, and mentors to access easily when needed. Next, we created prototypes of EACH component and only allowed ourselves to build in functionality that we felt someone within Umbaugh could finish out. We chose Articulate Storyline as one tool for the self-study, eLearning modules because we felt it was relatively easy to learn and Articulate would provide strong user support for Umbaugh through its learning curve. We chose the Knowledge Guru game engine for the other components because the Game Creation Wizard would make it very easy for Umbaugh to create its own learning games. Finally we created a training schedule that covered the first 12 months. This training schedule identified benchmarks an associate needed to be able to achieve by specific time points in the year. Training and skill development activities that supported achievement of the benchmarks were listed as well. The employee’s assigned mentor would be responsible for using scheduled mentor/mentee discussions to stay on top of the training schedule and verify that benchmarks were being achieved. No 100% dedicated training and development resource. Technology choices needed to be pinpoint accurate. Umbaugh was willing to invest in technology (and, in fact, made a eLearning software choice based on functionality and not price) but they wanted to buy what maximized their investment. Web-based tools needed to be simple but also expand to allow for eventual use of tablets in the workplace. A structure for any face-to-face training that enabled Umbaugh’s associates to deliver these sessions with minimal skill in facilitation/training delivery. Their primary role is client-facing work. Our goal was not to turn every Umbaugh person into a professional trainer but to empower them via the right process and tools.